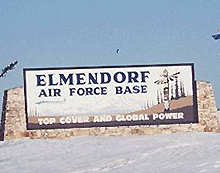 Elmendorf Air Force Base is located in the south central part of Alaska. The beautiful and diverse city of Anchorage, Alaska is immediately outside the base. This part of Alaska is sometimes referred to as "The Banana Belt" of Alaska. The 673rd Wing is JBER's host unit. As the largest and principle unit within the 11th AF, the 3rd Wing is tasked with providing air defense and air superiority in Alaska, as well as supporting Pacific Air Forces during contingencies in the Pacific Command area of responsibility.